Education: Kharkov State University (1973-1978), MS level degree in mathematics ; post-graduate course of Kharkiv State University (1982-1986 ) in " Geometry and Topology " (school of prof. Borisenko O.A). Degrees:I PhD in Geometry and Topology (1086). PhD Thesis " The geometry of tangent and normal bundles with Sasaki metric " under prof Borisenko O.A. advisorship. Positions: 1986--1991 the Assistant Professor, and from 1991 by now the Docent position at Geometry Chair of Mechanics and Mathematics Faculty in Kharkiv Karazin National University. Associate Professor degree awarded in 1992. Head of the Geometry Chair since September 2014. Member of the Academic Council of the Faculty of Mechanics and Mathematics . Visitig Professor in Texas A&M University (January-May 2006) (USA). Research interests: The geometry of submanifolds of fibered spaces, particularly geometric properties of vector fields and sections of vector bundles . The author of 46 publications (articles and talk abstracts). Participant of 19 International Conferences, particularly in Debrecen (Hungary 2000, 2002, 2004 ), Warsaw (Poland 2002), Varna (Bulgaria 2005 ), Bryan (Texas, USA 2006), Haifa (Israel 2008, 2013) . Teaching activity: Senior Lecturer of the department of Mechanics and Mathematics. Lecture courses include analytic and differential geometry, topology, classical problems in geometry, geometry of fiber bundles. Electronic manuals are hosted on the website of the University. The advisor of more than 40 Master’s Theses. 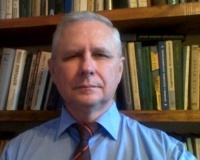 In 1978 received scientific degree «Магіст» , the thesis entitled «Дипломна робота «О группах гладких сингулярніх гомологий множеств в евклидовом пространстве»», scientific advisor Lec. Golovin V.D., Kharkiv, Kharkiv national university. In 1986 received scientific degree «PhD» , the thesis entitled «Дисертація к.ф.-м.н. «Геометрия касательного и нормального расслоений с метрикой Сасаки»», Одеса, Одеський державний університет ім. Мечнікова. In 2015 received scientific degree «Full Professor» , the thesis entitled «».